If you find yourself looking skyward and gazing longingly at the sight of a hot air balloon, you will be delighted to learn of a festival of ballooning this spring in Mid Devon. The long-awaited Tiverton Hot Air Balloon Festival will take place on 20th, 21st and 22nd May 2011 at Hartnoll Farm, Tiverton, just 10 minutes from Junction 27 of the M5, on the site of the Mid Devon Show. This fantastic visual spectacle will raise funds for two well-known charities; BBC Radio Devon’s Air Ambulance Appeal in aid of Devon Air Ambulance Trust (DAAT) and Exeter Leukaemia Fund (ELF). The weekend will be an awe-inspiring display of colour with more than 50 balloons expected to take to the skies. As well as the opportunity for visitors to view the balloons close up and meet the pilots, tickets are also available for balloon rides. With far-reaching views stretching across the beautiful Devon countryside, it is little wonder that these rides are described as “spell-binding” and “magical”. There will be plenty to see and do for families and visitors throughout the weekend, with catering for all tastes, bars, music, activities for children and a picnic area. The evening entertainment on Friday 20th and Saturday 21st will be a spectacular vision provided by “Night Glow”, where hot air balloons will give a stunning light display, all choreographed to music. The event is being organised by Aerosaurus Balloons, the South West of England’s largest balloon operator. 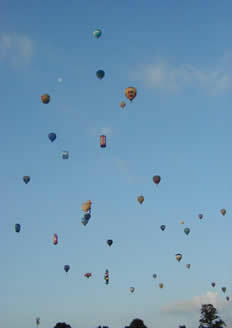 For further details and to purchase tickets please visit www.tivertonballoonfestival.co.uk or call 01404 823735. There are also opportunities for businesses to be involved and anyone interested should contact the organisers as soon as possible.